This unique “Tree Cross” concept has gone through a few phases since Sean's original conception, and has finally landed as a bold and heavier structured cross at 1 1/2” tall or 40mm (excluding bail) with a nice weight and feel a cross of such original presence. 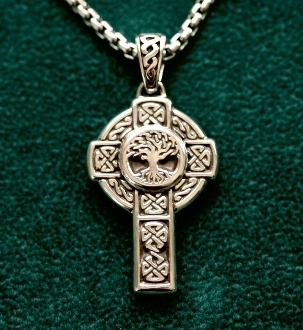 There may be a tendency to think of this as a more masculine piece, but due to the trends in bolder jewelry for women, and the appeal of this image, I believe this Tree Cross is not a gender specific design. That said, the oversized knot work chain bail will only be appropriate on heavier chain types, to match the presence of the piece. “The Tree of Life Cross” is our newest blending of symbolic connect from within the heart of Sean’s studio, honoring both the Natural World and the traditions of the Church. This offering blesses union to spiritualities that have blended and coexisted in the Celtic Lands throughout history. May this personal expression be an open invitation to those of you with symbolic affinity to reach beyond the borders of conventional belief, and embrace the union of spirit, natural forces, faith, and all the time honored traditions that comprise the beliefs of the past, present and future in the evolution of spirituality in Celtic Art.